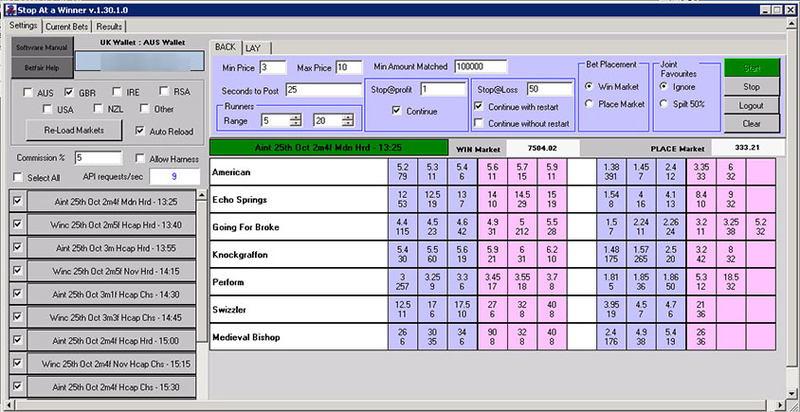 STOP AT A WINNER BOT is betting software tool that offers a platform to bet 'Back Market' and 'Lay Market' on Betfair, and on every horse race market on the Betfair Exchange, whether it be thoroughbred, or harness racing (Australia and New Zealand). STOP AT A WINNER BOT is betting software tool that offers a unique opportunity to make long term profit from Betfair. It offers a platform to bet 'Back Market' and 'Lay Market' on Betfair, and on every horse race, whether it be thoroughbred, or harness racing (Australia and New Zealand), as long as it is covered by Betfair. Although STOP A AT WINNER offers a different approach, first and foremost the software will bet for you per the simple instructions that you give it. It will also stake to recover losses and hit the required profit. Further, you can set the field runners that you will allow the bot to bet on; we use 5 to 20 runners in the backing option but this is entirely up to you. Also, you get the option to restart automatically once you hit your profit target if you wish.